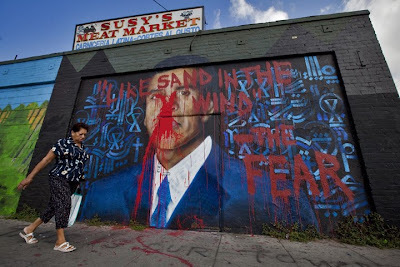 Once again the mural of L.A. Mayor Antonio Villaraigosa was defaced. This time is was done by the mural's creator, Rabi better known as David Torres. 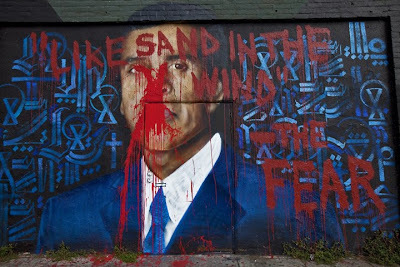 He wrote ' "like sand in the wind' - The Fear" upon his creation. He was referencing on how buddhist monks would blow away their sand mandala creations after finishing them, usually taking them many hours or days to create. Patrick Range McDonald has been following the strangeness for LA Weekly.